Special corrosion resistant powder coated finish on all interior and exterior surfaces, including shelves, offers the end users an excellent protective storage vechile for acids and and other corrosives. Powder coating gives superior protection against chemical attack in event of a spill or splash. For additional protection, each cabinet is supplied with high density polyethylene trays for the shelves and bottom of cabinet. Dimensions: 17.5" x 18" x 22.5"
Constructed to the same high quality specifications as standard size cabinets, these small storage cabinets are available in single door manual (Model 1904) and self closing (Model 1903) models. 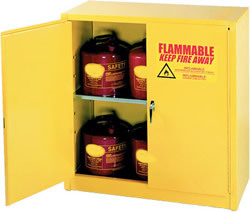 Ideal for storage of smaller containers of flammables, these cabinets can be used on counter tops, workbenches or on the floor. Dimensions: 23" x 18" x 35"
Constructed to the same high quality specifications as standard size cabinets, these small storage cabinets are available in single door manual (Model 1925) and self closing (Model 1924) models. 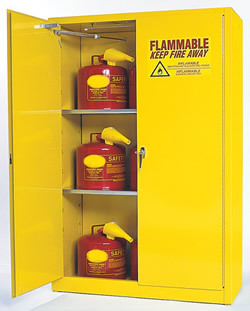 Ideal for storage of smaller containers of flammables, these cabinets can be used on counter tops, workbenches or on the floor. Dimensions: 23" x 18" x 44"
Constructed to the same high quality specifications as standard size cabinets, these small storage cabinets are available in single door manual (Model 1906) and self closing (Model 1905) models. 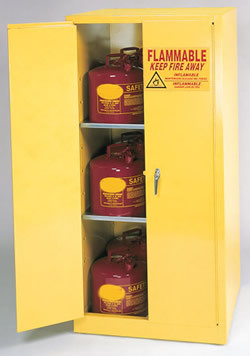 Ideal for storage of smaller containers of flammables, these cabinets can be used on counter tops, workbenches or on the floor. Dimensions: 23" x 18" x 65"
Only 23" wide, this cabinet features a 24 gallon capacity that will fit places a conventional cabinet can't - available in single door manual (Model 1923) and self closing (Model 2310) models. 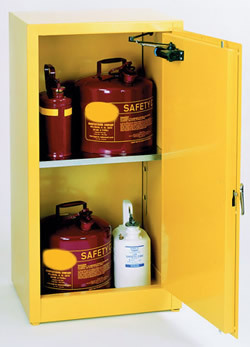 Dimensions: 43" x 18" x 44"
Model 1932/3010 Safety Cabinets are constructed of 18-gauge steel, sides, top, bottom, and doors are double-walled with a 1 1/2" air space between walls. Both vents, with 2" threaded fittings, have fire baffle and cap. 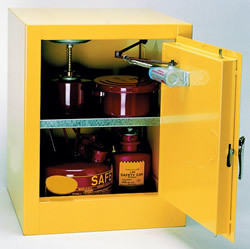 Safety Cabinets come in yellow high gloss powder finish with red warning, plus grounding attachment, 3-point key lock, and 2" raised, leakproof door sill. Each shelf is adjustable, supported by 4 brackets, and can support 350 pounds. 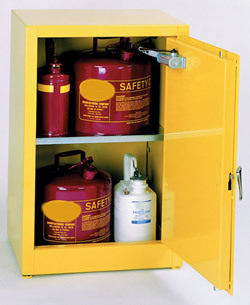 These Safety Cabinets are available in two door manual (Model 1932) and self closing (Model 3010) models. FM approved. Constructed of 18-gauge steel, sides, top, bottom, and doors are double-walled with a 1 1/2" air space between walls. Both vents, with 2" threaded fittings, have fire baffle and cap. 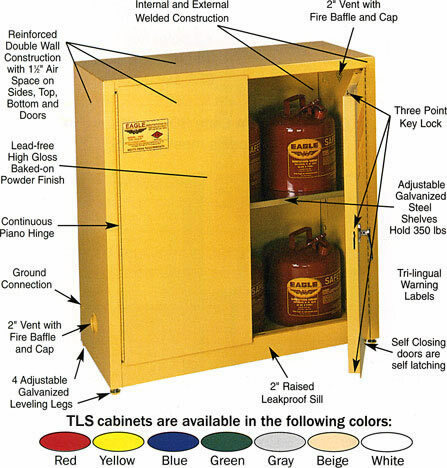 Cabinets come in yellow high gloss powder finish with red warning, plus grounding attachment, 3-point key lock, and 2" raised, leakproof door sill. Each shelf is adjustable, supported by 4 brackets, and can support 350 pounds. Available in two door manual (Model 1947) and self closing (Model 4510) models. FM approved. Constructed of 18-gauge steel, sides, top, bottom, and doors are double-walled with a 1 1/2" air space between walls. Both vents, with 2" threaded fittings, have fire baffle and cap. Cabinets come in yellow high gloss powder finish with red warning, plus grounding attachment, 3-point key lock, and 2" raised, leakproof door sill. Each shelf is adjustable, supported by 4 brackets, and can support 350 pounds. Available in two door manual (Model 1962) and self closing (Model 6010) models. FM approved. Constructed of 18-gauge steel, sides, top, bottom, and doors are double-walled with a 1 1/2" air space between walls. Both vents, with 2" threaded fittings, have fire baffle and cap. 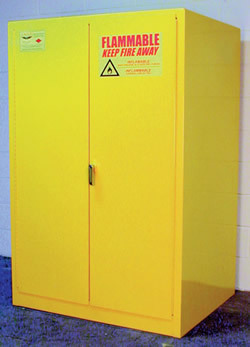 Cabinets come in yellow high gloss powder finish with red warning, plus grounding attachment, 3-point key lock, and 2" raised, leakproof door sill. Each shelf is adjustable, supported by 4 brackets, and can support 350 pounds. Available in two door manual (Model 1992) and self closing (Model 9010) models.